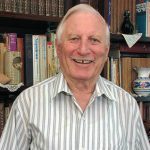 Professor Mordechai Gichon, one of the outstanding Classical archaeological and military historians of Israel in the last decades, passed away on 19 September 2016 at the age of 94. Born in Berlin in 1922 as Mordechai Gicherman, he moved to Tel Aviv in 1934 with his family. He began his studies of archaeology and history at the Hebrew University of Jerusalem, but interrupted them to join the Haganah in 1940, in what would become a long-lasting military career, prompted by the dramatic events of the times. In 1942, he enlisted in the British army, taking part in various wartime operations; later he was involved in organizing illegal immigration of Holocaust survivors to Palestine. He was discharged from the British army in 1946 and returned to Palestine, where he resumed his studies at the Hebrew University. 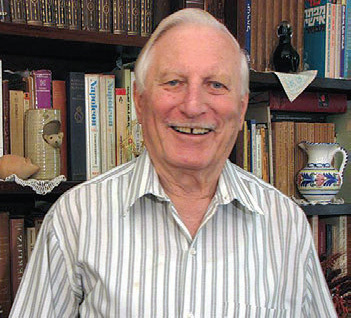 He rejoined military service before the Israeli War of Independence, serving in the military intelligence units of the IDF at the rank of lieutenant colonel until 1963. During and after his military activity he completed his studies with a Ph.D. dissertation on the ‘Palestinian Limes’ (submitted in 1969). He joined the newly established Tel Aviv University, becoming head of the Department of Military History and later (in 1965) co-founding the Division of Classical Archaeology in the Department of Classics with Prof. Shimon Applebaum. Mordechai Gichon was appointed associate professor in 1971 and full professor in 1980, retiring in 1990. Immediately after joining the Department of Classics, Mordechai initiated and developed pedagogic and research activities for the Division of Classical Archaeology. His scientific activity covered diverse fields, such as archaeology of the Roman frontier in the East, archaeology of settlements and the communication system between them, the Bar Kokhba Revolt, and military history and geography in general and that of Napoleon’s era in particular. His main interest, to which he devoted much of his career, remained the study of the limes. He conducted a survey in the Central Negev (1956–1970), focusing mainly on the remains of the fortified sites and their hinterland. The latter, in his opinion, played a crucial role in the maintenance of the largely fragile border of the Roman Empire in the desert regions. He surveyed and recorded some 150 sites, many of which have since been lost due to development in that area. He incorporated the results of his work in his Ph.D. dissertation on the limes in the Negev, which, unfortunately, remains unpublished. However, Gichon has published over 100 articles on his pioneering research, including a groundbreaking article titled ‘Idumea and the Herodian Limes’ (IEJ 17 : 27–42). Mordechai Gichon organized field research in military installations of the ancient Negev and their hinterland. Thus, excavations at En Boqeq (1968–1970), Migdal Tsafit (1975), Mezad Tamar (1973–1976) and Tel Mal¢ata (1979) became teaching, training and research projects, in which a whole generation of scholars was trained in this field. The publication of his monograph En Boqeq I (Ausgrabungen in einer Oase am Toten Meer, I. Geographie und Geschichte der Oase. Das spätrömisch-byzantinische Kastell; Mainz, 1993) represents one of the outstanding archaeological and historical reports regarding the Byzantine period. It was followed with the publication of En Boqeq II, co-authored by O. Tal and myself (Excavations in an Oasis on the Dead Sea Shores, II. The Officina; Mainz, 2000), illuminating the Early Roman period of the Dead Sea area. These publications, which offered an important contribution to the knowledge of the fringe areas of ancient Israel, have generated challenging discussions and debates on the character and role of the limes and its hinterland in the Near East. Gichon pursued his first field of archaeological interest, the study of the limes in the Near East, throughout his career, and became one of the leading promoters of the International Conferences on the Study of the Roman Frontiers (Limes), where he was several times honored with special distinctions. In 1967 he co-organized (with S. Applebaum) the International Limes Conference in Tel Aviv. supported a series of surveys and excavations along central roads of ancient Israel, mainly between Jaffa and Jerusalem. Thus, at his initiative, a large-scale survey was conducted in that region by B. Isaac, I. Roll and myself, all close collaborators of Mordechai. At the same time, he organized a major excavation project focusing on ancient Emmaus and its surroundings, in the course of which remains of ancient Emmaus (such as a completely preserved Roman period bathhouse), the fortified site of ¡orvat aAqed (including Hellenistic remains and hideouts from the Bar Kokhba Revolt) and the road station at ¡orvat Ma«ad (a Jewish pilgrims’ station from the Early Roman period) were unearthed and published. This activity (1977–1983) had a strong impact on the research of ancient roads and their hinterland. Mordechai Gichon earned numerous awards, including of the Volkswagen Foundation and the Fritz Thyssen Foundation, and used them to promote the abovementioned excavations and publication projects. The military history of the Land of Israel was another field of interest of Mordechai Gichon. His book, Battles of the Bible, co-authored by the late Chaim Herzog, former president of the State of Israel (London, 1978 [rev. ed. 2002]), is considered a masterpiece of history of military and intelligence activity of the Land of Israel through the ages and has been translated into many languages. In addition to his rich archaeological activity, Mordechai Gichon had a deep knowledge of Napoleon and his times. For many years he headed the Napoleonic Society in Israel, publishing books and articles on this topic. While his main focus was on Napoleon’s activity in the Holy Land (Napoleon in the Land of Israel; Reut, 2003; Hebrew), he knew how to differentiate between his personal sympathy for Napoleon as an outstanding historical figure with innovative achievements (such as the emancipation of Jews in Europe) and the negative impact of some aspects of his personality and actions. Another subject of his research, perhaps dearest to his heart, was the Bar Kokhba Revolt, a topic that drew his interest particularly after the discovery of the Bar Kokhba hideouts at Horvat Aqed. Just a few weeks before his death, the Hebrew version of his monograph, A Star Came out of Jacob. Bar Kokhba and His Time, was published (Tel Aviv, 2016). At the celebration of his 94th birthday in August 2016, he told me that he was working on an English version of this book; regretfully, he did not complete this endeavour. Mordechai Gichon’s main scholarly approach was a deep involvement in field work, combined with careful scrutiny of a large spectrum of written sources, from Hebrew and Aramaic through Greek, Latin and Arabic. Mordechai Gichon was always ready to share his vast knowledge, lecturing before non-academic circles and publishing his opinions in popular journals. Many generations of students and archaeologists have benefitted from his teaching and guiding. His office in the Yad Avner facilities of the Division of Classical Archaeology was always attended by scholars from Israel and abroad seeking his help and advice. Over the years, many young scholars — myself included — were ‘recruited’ by him (as he liked to term it), joining the faculty and becoming leading scholars in this field. I owe a good part of my career to Mordechai Gichon and remain grateful for the humane way in which he combined daily familiar cooperation with the experience of a traditional teacher. Mordechai Gichon was married from 1948 to Chava Goldberg (who passed away in 2015); she was his close collaborator in organizing the research projects and their publications. With the passing of Mordechai Gichon, the family of Classical archaeologists and historians in Israel has lost one of its important members as well as one of its most humane representatives.